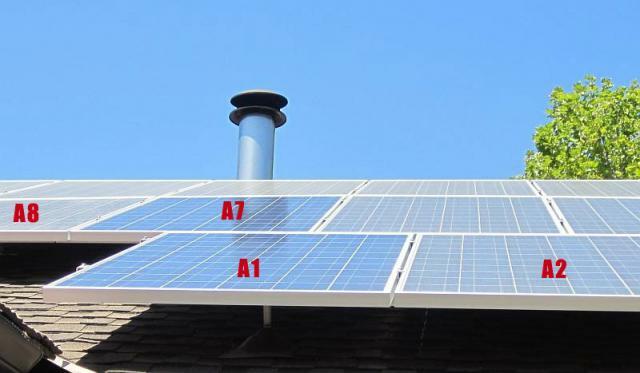 Cleaning Solar Panels – Does it make much difference? As I posted a year ago we added solar power to our house. Well, I noticed that our panels have a bit of a dusty haze / layer on them (the joys of living on a dirt road). I’ve cleaned them many times but with significant daily variations in production due to daylight hours, cloud-cover, haze, smog, temperature, etc. it’s almost impossible to isolate the impact that cleaning the panels has on the performance. 3. All the panels are equally dirty, so cleaning a controlled set of 2 should help me see if there is any difference. Modules A1 and A2 have only a 0.03% difference from a month’s worth of data! Modules A7 and A8 have 0.06% difference! A1 and A7 are both in line with one another and easier to reach, so I’ll clean both of them and then clean A1 “more frequently”. YAY!!! I LOVE controlled experiments and data!!! I took the power output from 2 days before the cleaning and compared it to the power output after cleaning. So if my data and my math are correct, cleaning has resulted in a 1.5% increase in one panel and 0.7% increase in another. I’m not sure how consistent these results will be across time and across each individual module, but it’s pretty interesting to see the results of this controlled experiment. I don’t know how much this will impact my cleaning behavior. I suppose that I’ll simply end up spraying them off a couple of times during the summer (more dust and no rain to wash away the dust) and may even use my new telescoping 11 foot pole squeegee window washing cleaner to really get them clean. So, what do you think? Does my process and data look legit? What would you have done differently? If cleaning your panels would produce a 1.5% increase in power, how often would you clean them? I also posted about this endeavor on my site www.SufficientSelf.com in my post here: Cleaning Solar Panels – Will it make much difference? WHEN IT COMES TO CLEANING YOUR SOLAR PANELS,WINDEX, AND SOME OTHERS, HAVE A WINDOW CLEANER IN A SPRAY BOTTLE THAT ATTACHES TO YOUR GARDEN HOSE. I USE IT ON THE EXTERIOR WINDOWS. THE BOTTLE HAS A RINSE-OFF-WASH VALVE SO YOU CAN WET DOWN THE WINDOW, SPRAY CLEANER, THEN RINSE CLEAN. DOES AN EXCELLENT JOB, BEATS THE HECK OUT OF SCRUBBING. THE METHOD USED DEPENDS ON THE TIME VALUE OF MONEY, AS WELL AS THE TIME AVAILABLE. 1.5% OF YOUR ELECTRIC PRODUCTION INCREASE AFTER CLEANING THE PANELS HAS A SIGNIFICANT ECONOMIC VALUE. Ken, thanks for the idea! I wonder if I could use a combo of that cleaner (or some homebrew) and use it in my power washer?? WHATEVER HOME-BREW YOU MIX UP FOR USE IN YOUR PRESSURE WASHER, IT NEEDS A WETTING AGENT SO IT WILL RINSE OFF CLEAN. GOOGLE FOR MIXING AMMONIA AND DISTILLED WHITE VINEGAR INSTRUCTIONS. I BELIEVE IT IS SAFE. YOU DON’T WANT TO MIX CHLORINE BLEACH WITH AMMONIA, THOUGH, AND PROBABLY NOT WITH DISTILLED WHITE VINEGAR. BEWARE THE AMOUNT OF DAMAGE YOUR PRESSURE WASHER CAN DO, PARTICULARLY WITH THE NARROW STREAM. IT CAN CUT THROUGH VINYL SIDING, TEAR THE SURFACE OF WOOD , GO UNDER WOOD SIDING AND PENETRATE INTO THE INSULATION AND DAMAGE THE INTERIOR OF THE WALLS. THESE ARE JUST SOME OF THE PROBLEMS I’VE ACTUALLY SEEN WHEN I’VE BEEN ASKED ABOUT HOW TO REPAIR THE DAMAGE. ONLY USE A FAN SPRAY ON THOSE SURFACES, LET THE CHEMISTRY DO THE CLEANING. THE PRESSURE WASHER IS A GREAT TOOL FOR CLEANING GREASE, DIRT AND MUD FROM MACHINERY, THOUGH. Thanks Ken! I’ll only be using the pressure washer to apply the chemicals, not so much for the pressure… which I know can be very damaging and must be used carefully! Interesting that you brought up a “wetting agent”. On the inkjet forum I posted about a recent purchase of Propylene Glycol (used as a wetting agent and dispersant)… I wonder if it would be good to have in a home brew for window / panel cleaning? DOES THE COLLECTOR MANUFACTURER HAVE A RECOMMENDATION ON CLEANING? I WOULD TRY THE PROPYLENE GLYCOL, MAYBE COMPARE IT TO CALGON, AS USED FOR SPOT-FREE DRYING IN A DISHWASHER, TRY TO FIND AN OPTIMAL CONCENTRATION. A GOOGLE SEARCH SHOULD FIND A NUMBER OF NON-IONIC WETTING AGENTS THAT WOULD WORK. THE COMPOSITION OF THE GLASS MAY BE A FACTOR, I WOULD ONLY TEST ON A SMALL AREA, AN INACTIVE AREA IF POSSIBLE, JUST IN CASE YOUR FORMULA ACTUALLY ATTACKS THE GLASS, JUST AS SOME DRINKING GLASSES DEVELOP A MILKY HAZE WHEN ATTACKED BY THE DISHWASHER DETERGENT. I WOULD TRY THE SAME SPOT WITH THE SAME FORMULA SEVERAL TIMES, JUST SHORTLY AFTER IT DRIES FROM THE PREVIOUS APPLICATION. SOME GLASSES TAKE MANY EXPOSURES TO A CLEANING AGENT BEFORE THE HAZE BECOMES VISIBLE, A CATASTROPHE ON SOLAR PANELS. Great experiment! Thanks for publishing. I generate about 12,000 kwh a year with a value to me of about $2,000. At 1.2% increased production from cleaning, that amounts to $24 bucks a year so I think I’ll just hose down a few times a year. i have 6 panels (2 months old) dirty generating about 19 A @ 24V. I just setup 6 new panels and they generate about 29A @ 24V. In Norway solar panels are used on some cabins, including mine. I’ve polished them with car polish. Dust blowes off and they dries faster after rain.